I just can’t miss seeing the Fish when they’re in town. I let nothing stand in my way, even the dental surgery I had last night. It was with a sore jaw that I saw them rock Baltimore last night. New York got its chance to beat up on the Orioles and the Indians to improve their record. Now it’s time for Florida. Hanshin Tigers (13) at Hiroshima Carp (7). A real brutal game for the pitchers. Kan Otake has a bad night, but my boy Higashide manages two RBIs. The Carp still hold on to fourth, but their record drops to 26-35-2. Saitama Seibu Lions (5) at Rakuten Eagles (3). Could moving Ma-kun’s starts around have affected his rhythm? It’s odd for Tanaka to give up five. We’ll see if he’s this bad next week too. The Golden Eagles are now 30-34-1 in fifth. 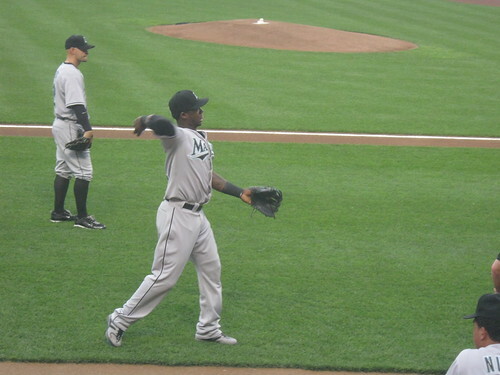 Florida Marlins (10) at Baltimore Orioles (4). Not Anibal Sanchez’ best pitched game, but not a total wash either. I think I see Wieters homer most games I go to. The kid’s got some pop. Florida’s record improves to 34-36 in fourth while Baltimore drops to 19-51 in a historically bad last. Kansas City Royals (3) at Washington Nationals (4). Atilano managed a decent start after a few miscues the last few times up. Facing the Royals can only be good for Washington and tonight’s matchup is bound to be yet another impressive Strasburg start. Washington is still in fifth with their 33-39 record. San Diego Padres (2) at Tampa Bay Rays (1). This is as hard-luck as they get. Wade Davis has really been struggling, but this could have been turned around with a little more offense. The Rays retain their tie with Boston for second, 1.5 games back with a 42-28 record. I can’t believe it ended 10-4. Danielle and I really thought the Orioles rally in the bot of the second was gonna tie up the game, but they lost their steam. Not even two homers could save them. Anibal Sanchez didn’t have a particularly great game, but he got really lucky on a bunch of hard hit balls that went to the deepest points in the park. You can’t buy better luck than that.